I knew I was going to get hungry at some point during my travels from NYC to Austin so before I went to the airport I picked up a sandwich for later. I was staying at my friend V's apartment (thanks V!) 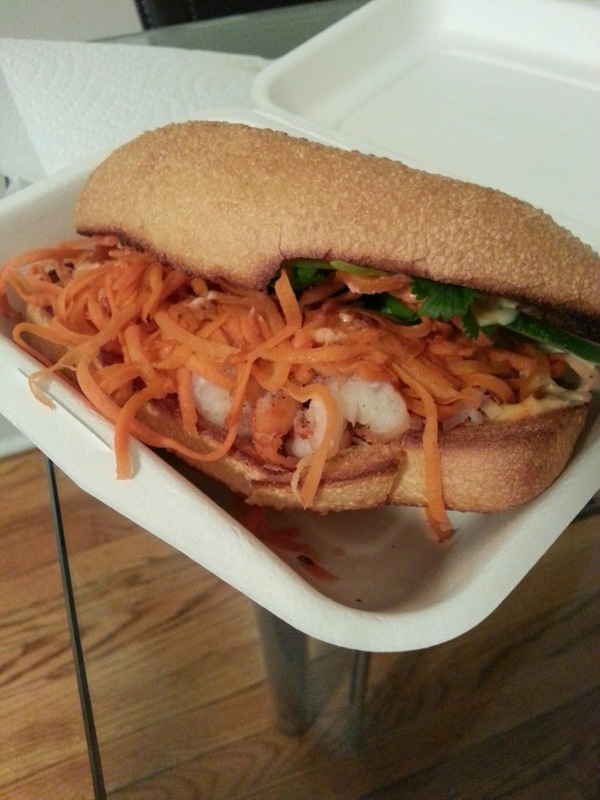 and this Cambodian sandwich shop (Num Pang) was nearby and came highly recommended. The woman at the counter was very friendly and when I asked her which sandwich would travel best, she recommended the coconut shrimp sandwich. It was probably four hours later that I actually ate it, and it was pretty damn delicious - but like with most things I think it might have been even better if I had it fresh when it had just been lightly toasted and handed over to me. Still, the flavors were great and it felt relatively healthy due to the amount of veggies in it - it's certainly on the expensive end of takeaway sandwiches but let's just call it a treat.